Recently announced is the River's Edge Music Festival, to be held on June 23rd and 24th at Harriet Island in Downtown St. Paul Minnesota. Just steps from my front door, by the way. 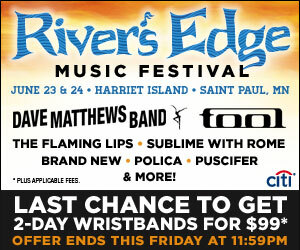 If you are thinking about going, you have until Friday to take advantage of the 2-day wristband offer for just $99. The line-up looks solid, and they keep adding artists to the list. They just added Sublime today as a matter of fact. Plus they have a few local bands rounding out the list, including one of my personal favorites Polica. So if you are looking for a summer music festival, but driving half way across the country isn't an option. Well, now there is one I can literally walk to. How cool is that.